Simply the easiest way to enjoy the best surf & turf at home. 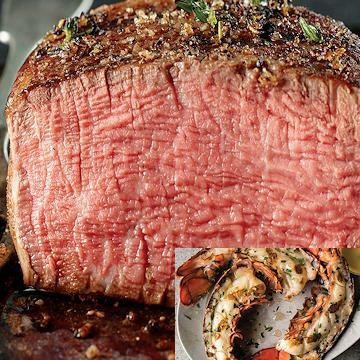 Get our KETO: Surf & Turf for 2 with Lobster Tail Halves, and keep an incredible five-star, protein-packed dinner for 4 at the ready. Uniquely mild Filet Mignons (aged a full 21 days to tender perfection) pair here with ocean-fresh, pre-split Lobster Tail Halves from World Port Seafood. Preparation: Do not thaw. Broil: Preheat oven broiler on high. Remove tails from plastic and arrange on broiler pan, meat side up. Brush with butter. Broil for 7 minutes. Turn and broil another 5-6 minutes or until meat is no longer translucent. Grill: Preheat grill on high. Remove tails from plastic and brush with butter. Arrange tails on the grill with the meat side up. Grill for 7 minutes. Turn and grill another 5-6 minutes or until meat is no longer translucent. Stovetop: Bring 2 quarts of water to a boil in a large saucepan. Remove tails from plastic and place in boiling water. Return to a boil and cook tails approximately 5 minutes or until meat is no longer translucent. Bake: Preheat oven to 450�F. Remove tails from plastic and brush with butter. Place on baking sheet with meat side up. Cook for 15-16 minutes or until meat is no longer translucent.